Beatrice currently purchases power from Nebraska Public Power District, though the power that arrives can come from other areas, as well. This arrangement will change after next year, however, when Beatrice begins the process of transitioning to its new provider, AEP Energy Partners Inc., based out of Columbus, Ohio. A new provider isn’t the only change in store for the department. Renewable energy will likely come to Beatrice at some point, in the form of wind or solar generation. Click here to read the complete news story. Photo Credit: Scott Koperski / Beatrice Daily Sun. 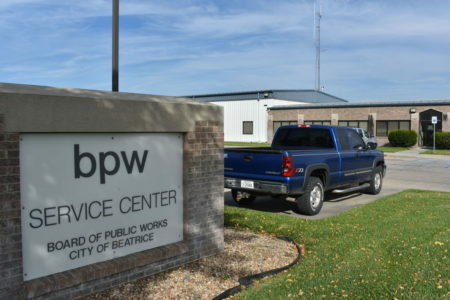 Beatrice’s electric department operates out of the BPW service center in North Beatrice. The department includes 16 workers who maintain and repair Beatrice’s systems. This entry was posted in Nebraska / Midwest News, NewsBlog and tagged AEP Energy Partners Inc, Beatrice Daily Sun, Beatrice's electric department, City of Beatrice, Nebraska Public Power District (NPPD), Nebraskans for Solar, renewable energy, Scott Koperski on November 19, 2017 by Helen Deffenbacher.